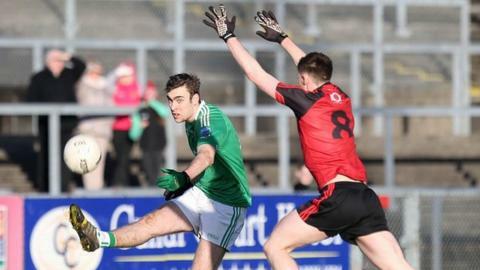 St Mary's stunned Donegal and Fermanagh defeated Down in Sunday's McKenna Cup Section B encounters. Goals from Jack Grogan and Ryan Johnston helped the students to a 2-6 to 0-8 win over Donegal at Letterkenny. Odhran McNiallas starred for the hosts with six points but St Mary's finished strongly to secure a first win. Sean Quigley fired over seven points as Fermanagh beat Down 0-14 to 0-8 at Pairc Esler Newry to make it two wins from two games. Tomas Corrigan added three points for the Ernemen, who held a 0-8 to 0-4 advantage at the break. Darragh O'Hanlon (2), Sean Dornan, Ryan Boyle were on target for the hosts in the opening 35 minutes. Coalan Mooney reduced the gap to three on the restart but Fermanagh stayed in control to register another victory. Grogan's early goal set St Mary's on their way to a surprise success over the 2012 All-Ireland champions. The sides were level at 0-5 to 1-2 at half-time and the sixth point from McNiallas put Donegal 0-8 to 1-4 ahead deep into the second half. Johnston rattled the net before points from Patrick McBride and Conal McCann ensured a memorable win for the Belfast students.